Nuuk (Danish: Godthaab or Godthåb) is the capital of Greenland. It is around the mouth of island Nuup Kangerlua (Danish: "Godthåbsfjorden") on the west coast of Greenland, about 240 km (150 mi) south of the Arctic Circle. The city has a population of 15,047 people. It was founded in 1728 by the Norwegian missionary Hans Egede. Egede named the city Godthåb which means Good Hope. Today, the people of Nuuk are mainly Inuit and Danes. 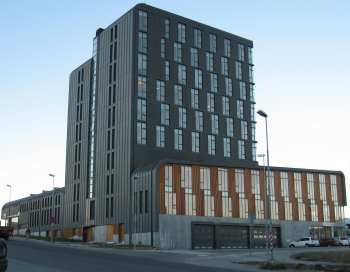 Nuuk is the location of the University of Greenland. The statue of Hans Egede in Nuuk. Nuuk Facts for Kids. Kiddle Encyclopedia.